Arsenal chief executive Ivan Gazidis has criticised the number of tickets that the Gunners and Hull City have been allocated for the FA Cup final. Both clubs will get 25,000 for the final on 17 May, despite Arsenal having had 49,000 for Saturday's semi-final. "We are disappointed many of our supporters and also those of Hull City will be unable to get tickets," Gazidis told the club website. "The balance in the FA's allocation system is not right." The Football Association will distribute in the region of 20,000 tickets to volunteers through the "football family", which includes county FAs, leagues, local clubs and charities, the 92 Premier League and Football League clubs and another 134 full member clubs. With the FA Cup final being part of the Club Wembley membership package, 17,000 tickets will also be allotted elsewhere. 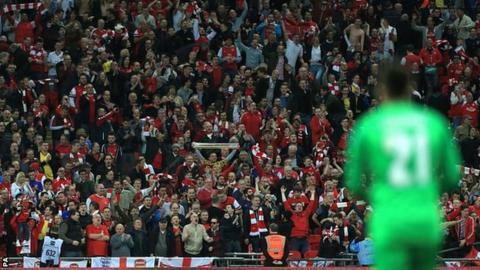 Gazidis, a member of the FA Council, said Arsenal have approximately 45,000 season ticket holders and 150,000 members. "There will be many disappointed Arsenal fans who have supported the club home and away for years," he said. Arsenal, who are looking to end a nine-year trophy drought after beating holders Wigan on penalties in the semi-final, plan to show the FA Cup final live at the Emirates Stadium.